Its functionality goes far beyond electrical value measurements: built-in temperature sensors, lighting sensors, and sound volume sensors can be extended by optional probes for measuring oxygen concentration, humidity, or pH. Like other products from this company, this device needs to be connected to a computer via USB (free PicoLog 6 software is compatible with Windows, MacOS, and Linux environments, including Raspberry Pi and BeagleBone). 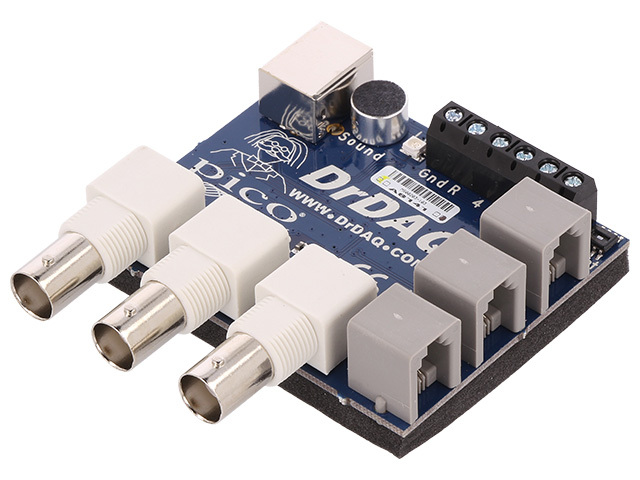 The PicoLog software enables sensor scaling and adding new mathematical channels, thanks to which DRDAQ can take over toilsome computation tasks. The device features 4 digital I/O channels that can be programmed using a free Software Development Kit in C, C+, C#, LabVIEW, Python, or MatLAB.